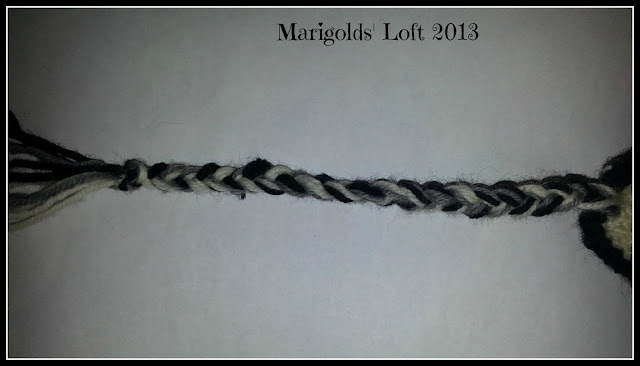 *M1R: Pick up strand between two stitches from the back. *M1L: Pick up the strand between two stitches from the front. *K2tog: Knit two stitches together as if to knit. *SKPO: Slip one stitch, Knit 1 stitch, Pass slipped stitch over. On 4mm cast on 7 sts with white. Repeat this increase (°-°) 3 more times. Knit 4 rows in st st.
Repeat increase (°-°) on next K row. *Knit 3 rows in st st.
Repeat *-* 2 times more. Next row (Knit row) repeat increase again. Place stitches on a stitch holder or spare piece of thread and knit next ear flap. Taking 1 Ear-flap in MC and 1 Ear-flap in CC, Place stitches onto 2 separate DPNs. 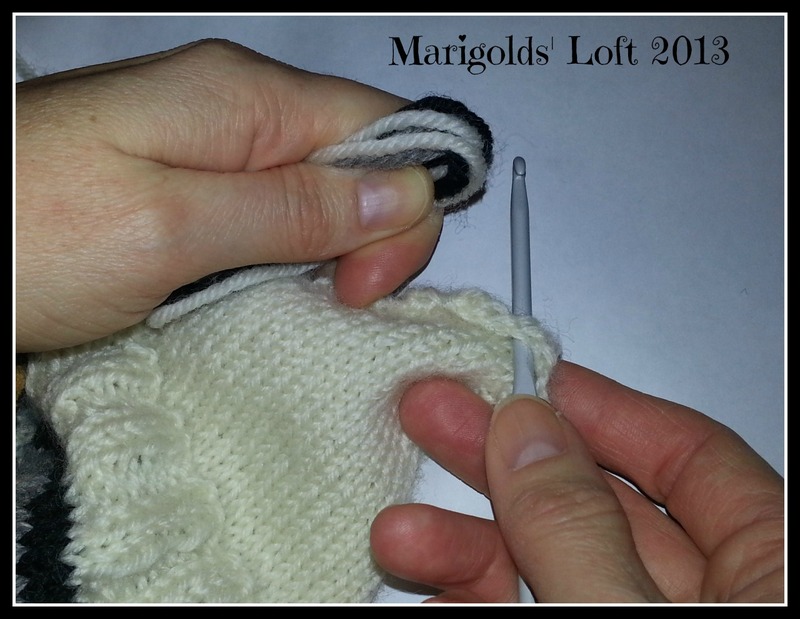 Now, holding the ear-flaps purl-sides together, knit the stitches together on one needle using the 30cm MC thread. Do the same for the other ear-flap. 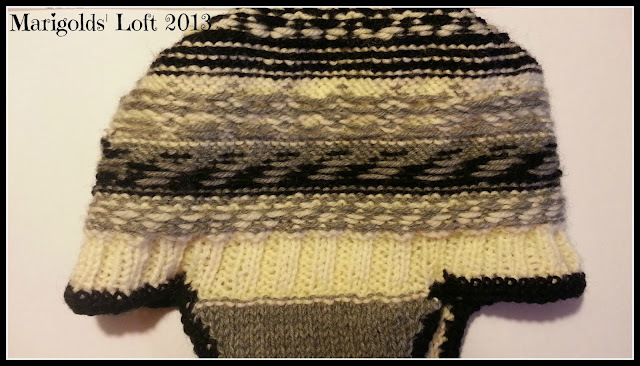 Knit Rib (K2,P2) for 8 rounds. Now continue with pattern working from the bottom up. 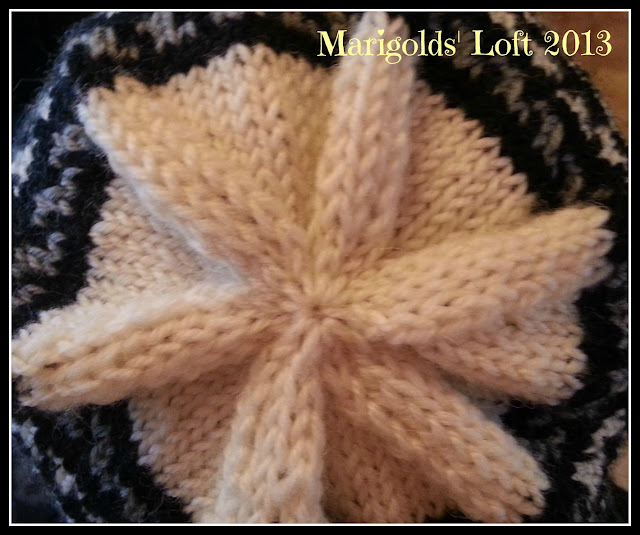 The pattern is built in a 6 stitch repeat. This means you begin the row on the right side of the row, and work your way across, repeating the pattern through the row. *K to 3 st before marker, K2tog, K1, sm, K1, SKPO* Repeat *-* until the end of the row. Break thread and thread the yarn through all the stitches and pull closed. Sew in all the loose ends on the wrong-side. The wrong-side should look like this. Using the crochet hook and the remainder of the black wool, begin at the tip of the ear-flap and do a round of single crochet along the entire edge of the cap. 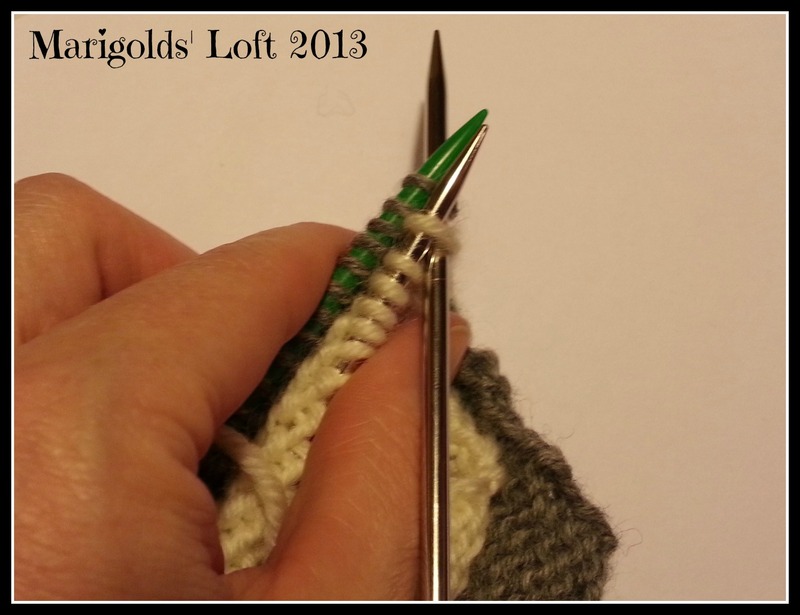 Once back at the beginning, do another round of single crochet and bind off. Take 2 strands of each colour wool, approximately 2m long, fold in half and cut. 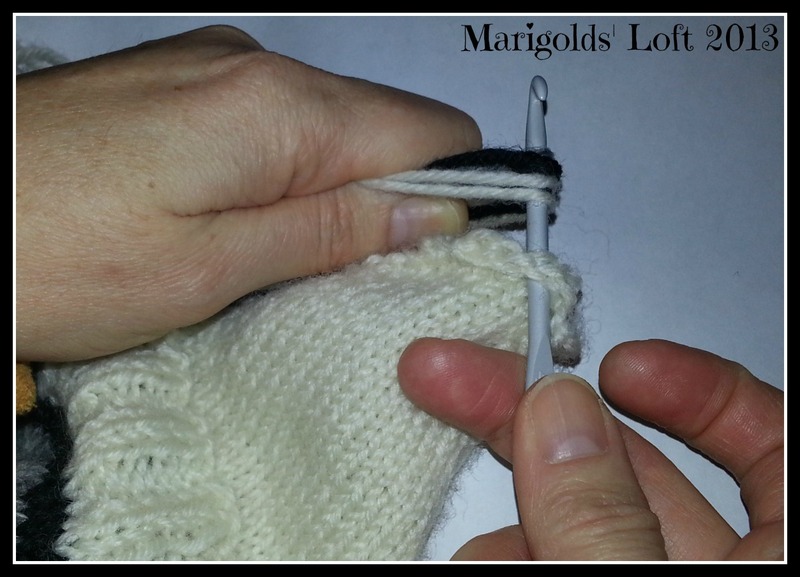 Now taking the first set of 6 strands, fold in half and using the crochet hook, pull through the middle stitch on the tip of the ear-flap. 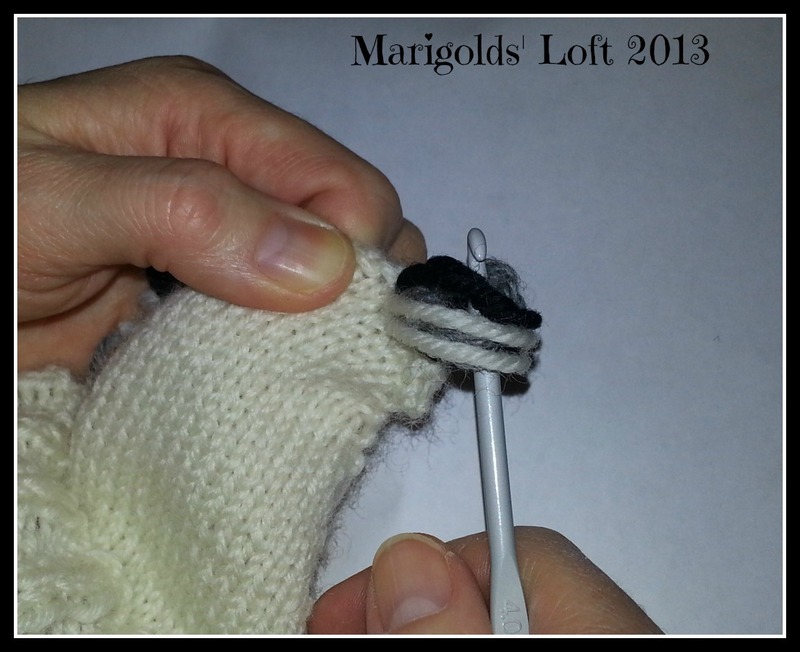 Once it is through, pull only half of the strands through to the other side. 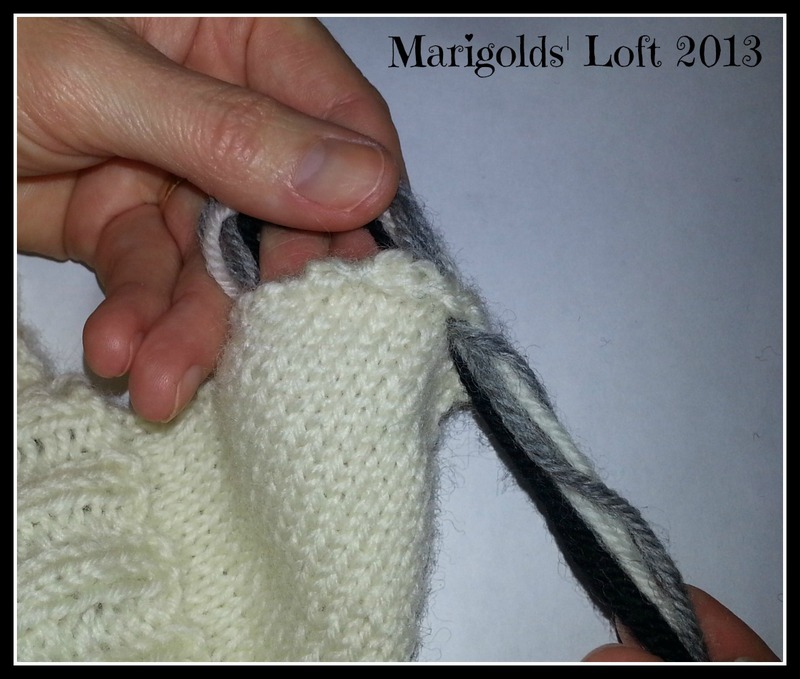 Continue by plaiting the yarn to desired length and cut. 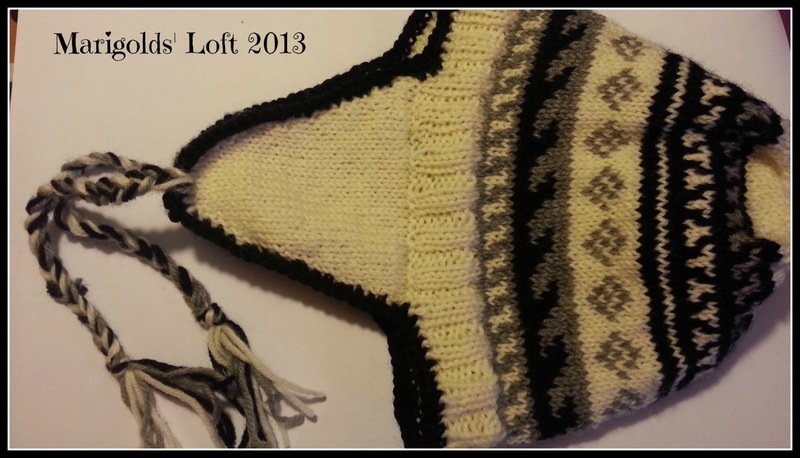 For those of you who would like to have the Fair-Isle (Colour-work) chart as a download, please Email me and I will send you a copy. Hi and you really don't need to reply-as I know how busy you must be. 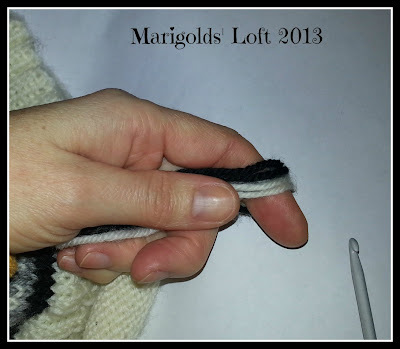 Just wanted to tell you that I stumbled upon your Blog through your pattern on Ravelry. I've been w/ the Rav since their beginning. Absolutely adore it. Love your blog. So very interesting and exciting. I think eclectic would be a good description and a sincere compliment. I have book marked your site and hope to visit your blog many times. Cute hat! I found you on the Clever Chicks Hop and I would love to have you join the fun on my Creative HomeAcre Hop! Thank you, will definitely come over and link up next week. Thanks for the invitation and for dropping by. This is very cute! I wish I could knit! Thanks for linking up at my Pin Me Linky Party. Looks very neat! Happy SITS day! Thank you very much and thanks for your visit. When I was a kid, no one would wear flaps. They weren't cool. Now they are fashionable. Thanks for the pattern. Enjoy your SITS Day. My oldest daughter would really love this hat. If I could make it look even close to that one, she would be elated! I'm going to give it a try and I'll show you my end beautiful project or major fail when I'm done. I have no pride, but do love to knit. Thanks for sharing it and beautiful site. This is really cool and my oldest (16) actually loves this type of hat...thanks for sharing and Happy SITS Day! Love this hat. and the pictures are such a big help. I've been looking for a 'cozy craft' to make this fall. I may just have to try this! Thanks for sharing and Happy SITS day! Sigh... wish I could knit. This is SOOO cute! It really isn't as hard as it looks :) If you want to give it a go, I am available should you have questions. I love crocheting...thanks for the pattern freebie...and happy SITS day, too! Could I get the Earflaps pattern please? I am guessing you are looking for the cap fair isle pattern? If you follow the link in the above post, you will come to the colour chart. Hope that helps you, let me know if you are still having problems. Hi, Natalie. I found that pattern, but it only appears to be from the diamond shape up, the sections below the diamonds are missing. I have just downloaded the chart again to see if it has issues but it looks fine. 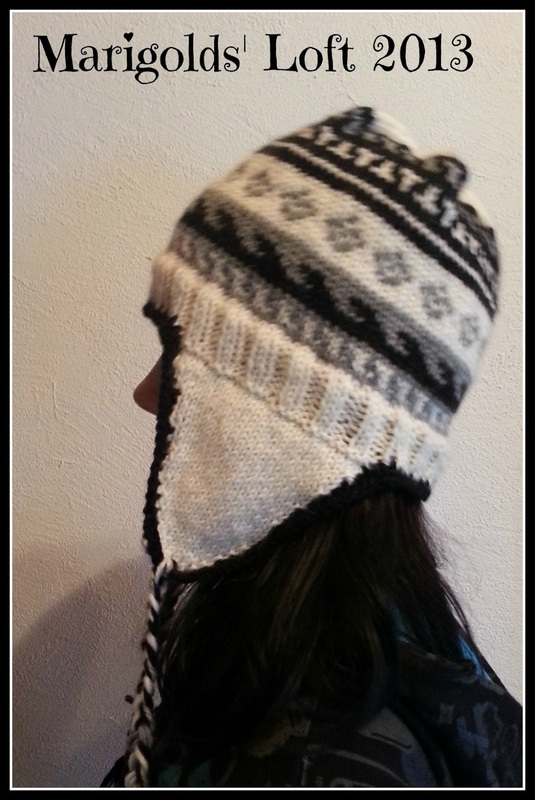 You should get 1 page PDF and the whole pattern should be on there. Perhaps try and download it again? It should have 45 rows of pattern. I hope you come right. 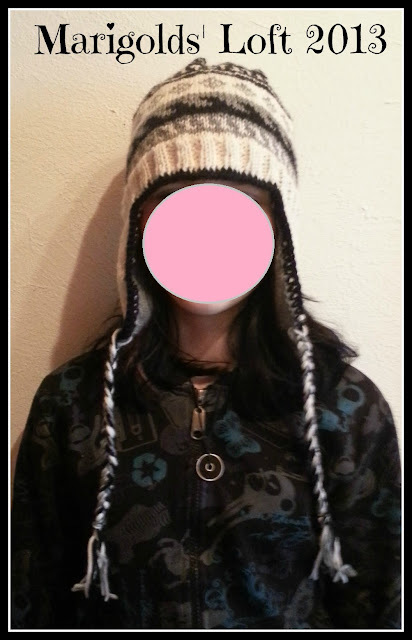 Hi Natalie: I have been looking for an earflap hat pattern I can felt. Is this possible with this pattern and if so what size needles would I need to use. I'm planning on using patons classic wool worsted weight. 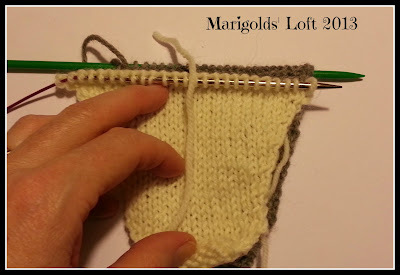 I guess you could use this pattern to felt, but you would have to work out the pattern again taking into consideration that projects once finished will reduce in size through the felting process and go in a general 30 - 40%. 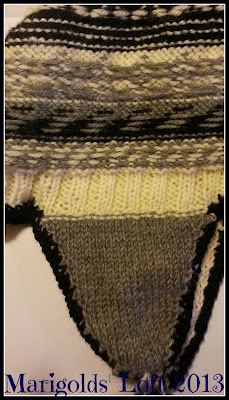 Your best bet would probably be to knit up a swatch and felt it to see exactly what size difference you are working with and try and work out the changes to the pattern from that. 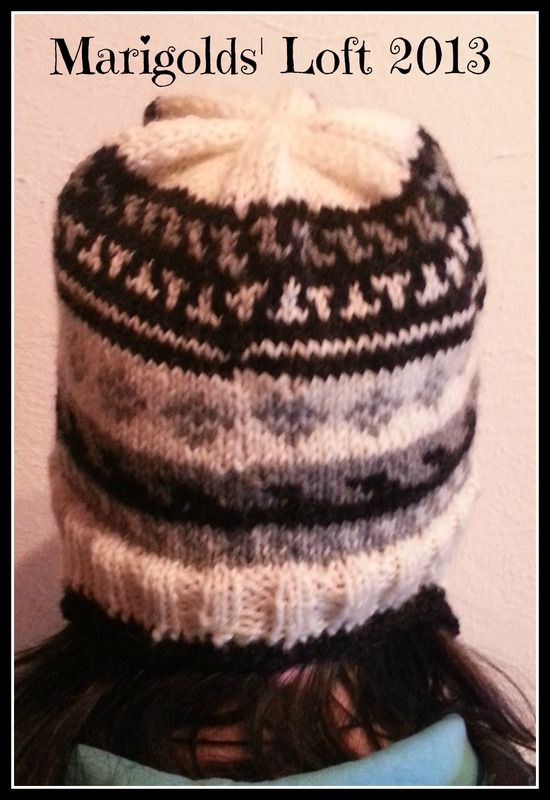 Love the pattern I think I can knit the hat my only question and I hope it's not too silly, are the earflaps joined together when you single crochet around the edge of the hat and the ear flaps. Yes, you are correct, the crochet is what joins them together. I hope you have fun, if you have any other questions please do not hesitate to ask them!